The incomparable Stan Lee, as he appears in Marvel’s Spider-Man. 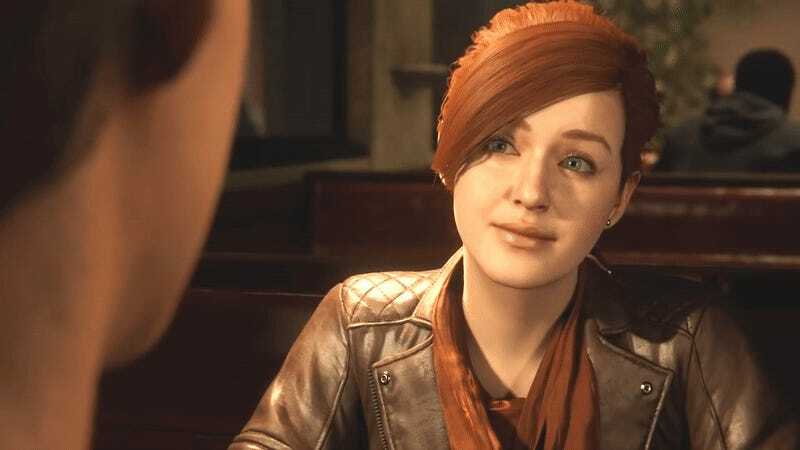 The recent PS4 game Marvel’s Spider-Man also features a Lee cameo (sure, it’s a game and not a movie, but it’d almost feel wrong without one) that is likewise ephemeral and fleeting. 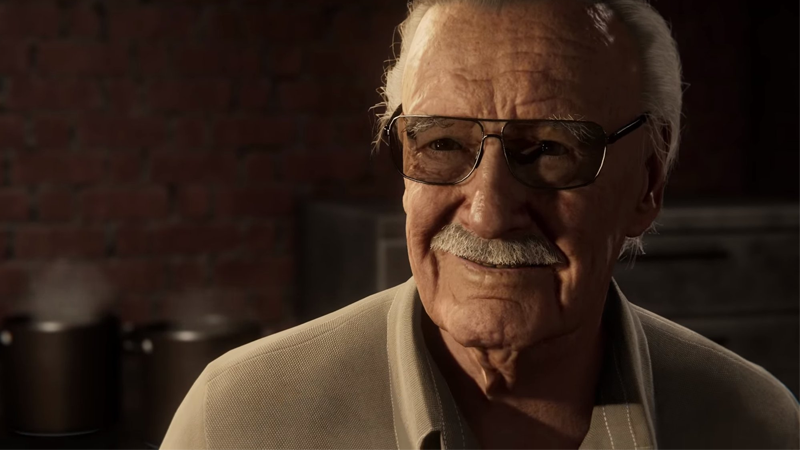 But taking a look back at the wider scene in the game it’s placed in, it is perhaps the perfect Stan Lee cameo—and in light of his passing, it becomes one of the most perfect tributes to Lee’s legacy as a creator who played a part in forging some of pop culture’s most marvelous icons. Spider-Man is set in an entirely new interpretation of the Spider-Verse from Marvel lore, telling its own story with its own versions of Peter Parker, his amazing friends, and his superior foes. It offers some twists on what people know of Spider-Man to present a fresh interpretation...like, for example, the fact that Peter and Mary Jane Watson are not romantically intertwined, having broken up six months before the events of the game (never mind that, up until three months ago, Peter and MJ had not been together for over a decade in the comics). Fell right into that one, buddy. Early on in Spider-Man, the two bump into each other for what is meant to be the first time in a significant while—Peter, on the job as Spider-Man, investigating reports of shady dealings at an art gallery that MJ herself is already looking into as part of her job as a reporter for the Daily Bugle. 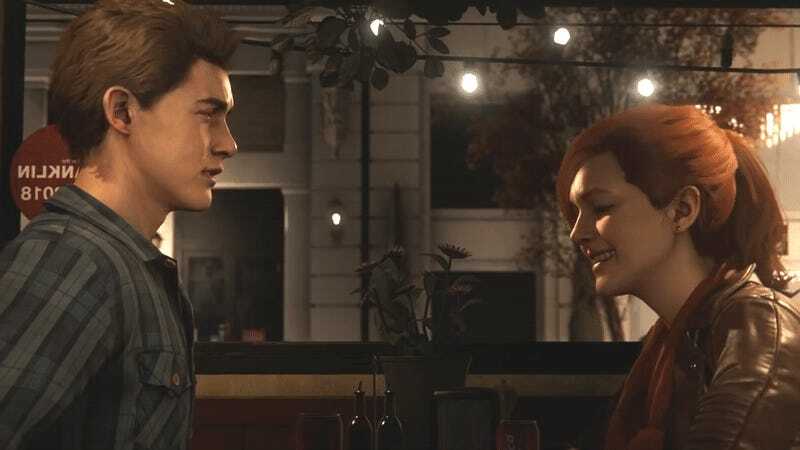 After putting aside their surprise to see each other in order to get out of an impromptu gang attack on the gallery, Peter and MJ set up a more formal reunion over dinner at one of their favorite former hangouts: Mick’s, a diner-turned-Italian restaurant. It is, as you’d expect of a reunion between any set of young twenty-something former partners, a heady mix of endearing and awkward to witness. As Peter earnestly goofs his way through updates on his life as a scientist and MJ sniffs out her next big story to cover, you get to see the spark that brought these two people together in the first place slowly begin to rekindle, even as we’re also reminded of why they separated. And in true Spider-Man style, just as things seem to be getting potentially intimate between the two, duty calls: Police sirens from speeding cop cars come wailing by in the background. Peter’s normal life and his spider-life once again come crashing together. Saved by the spider-bell, Parker. Peter dashes off to do his Spider-thing by MJ’s leave, and she laugh-sighs to herself as she watches him go—leaving a tip for the cook for their unclaimed meal, as the camera pans up and reveals that the cook, of course (who else could it be? ), is none other than Stan Lee. Lee smiles back at MJ, before excitedly adding “Love seeing you two together! You always were my favorites,” and the scene ends. It is not just Lee’s presence, or the metatextual nod to two of his most famous co-creations—Peter, of course, with the dearly missed Steve Ditko, who we also lost this year, and MJ with both Ditko and John Romita Sr.—that make the cameo so lovely, and it’s not even the context it now has as being one of Lee’s final cameos released before his passing. Instead, it’s that it is Stan Lee, quietly watching over one the most Stan Lee scenes possible. A battle with the returned Scorpion at the Daily Bugle offices in The Amazing Spider-Man #29, briefly interrupted by Peter getting fixated on his love life again. We take it for granted now that good superhero stories don’t just tackle the larger-than-life drama of explosive villain fights and daring acts of heroism, but the more grounded and intimate struggles of everyday life that we all deal with. But we only take it for granted because we saw that clash of the masked and unmasked personas unfold in Lee’s foundational work on characters like Spider-Man and the Fantastic Four—the mighty rebirth of superheroes in the early ‘60s would arguably never happened without it. The superheroes of the golden age were perfect heroes, almost untouchable gods—the silver age, and Lee’s most iconic work in those early years, is defined by making them flawed and relatable. By making them not just superhuman, but simply human as well. Spider-Man is perhaps the greatest example of that ideal Lee championed, and always has been. The early days of keeping his secret identity, his struggles with work, family, and, yes, his love life—these are all as indelible to the character as the parts where he swings between rooftops in blue and red Spandex. While his peers were mythical beings, military supersoldiers, or billionaire geniuses avenging threats to the whole world, Peter Parker was just a kid from Queens, balancing fighting crime while wondering whether he and his Aunt May will make rent money that month, or how his next date would go (be it with Gwen, or with MJ, or with whoever), or wondering about a host of other personal dilemmas. Peter takes to the skies to get away from his romantic problems in The Amazing Spider-Man #42—Mary Jane’s first full appearance as a character. It’s that human relatability—that even the amazing Spider-Man is, behind the webshooters and the mask, a bit of an awkward goofball like we all can be—that has made Peter Parker endure in our hearts and minds as one of the world’s most beloved superheroes. It is a trait that equally endured throughout Lee’s work on the character, and his countless other co-creations. So what better way to weave Stan Lee into Marvel’s Spider-Man than to have the man himself bear witness not to some sweeping act of Spider-heroism, but a quiet, little moment between two of his most iconic creations, that highlights one of the keys to his success as a writer? It’s funny to think that--after years and years of movie cameos--one of the best to remember Lee’s legacy by comes in a video game instead.